Happy Tuesday Everyone. 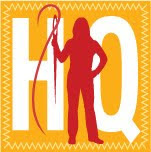 After about three weeks off from classes, I'm diving back into school tonight to attend the orientation meeting for an online class I am taking for Winter Session. Winter Session - three units in three weeks. Oh my. First up I'll show you a new bag I have started working on. 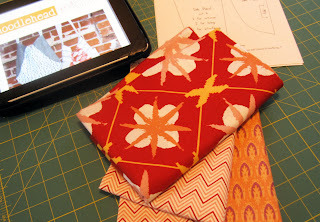 Leanne from She Can Quilt has made a bunch of the 241 Tote's by Anna Graham from Noodlehead and so I decided yesterday to purchase the pattern and cut into the fabric I purchased at Birch Fabrics, the brick & mortar store for Fabricworm.com while I was in Paso Robles, CA last week. 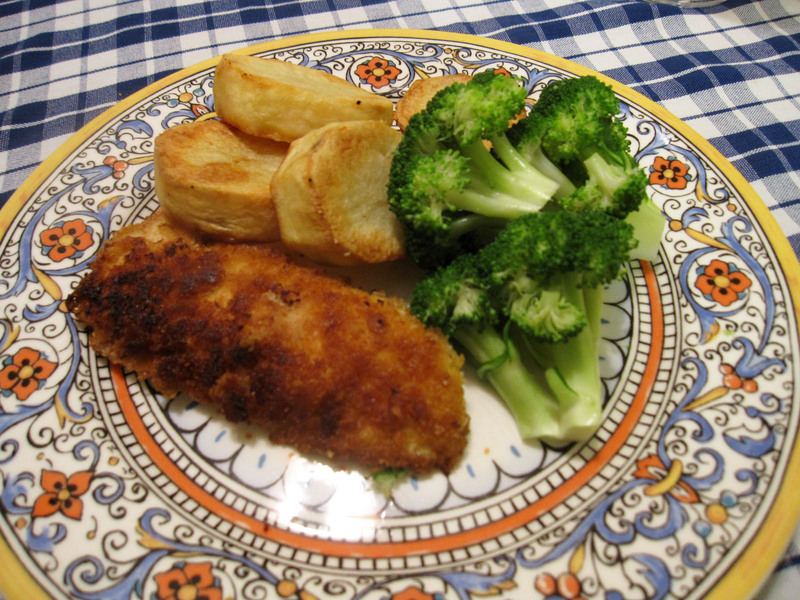 Last night for dinner I made Chicken Schnitzel, Roast Potatoes and Steamed Broccoli for the family. As I was thinking through the meal during the afternoon, I realized that the Roast Potatoes would be a perfect "tutorial" to highlight here for those whom are interested in dabbling in new kinds of cooking methods. I'm no pro - I just love to cook, so please don't judge. 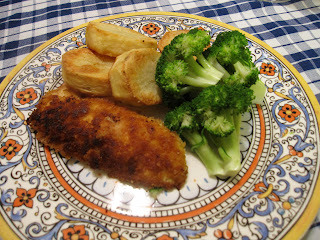 This recipe makes enough for 4 - one potato = one person so this is easy to half/double, etc. 1. 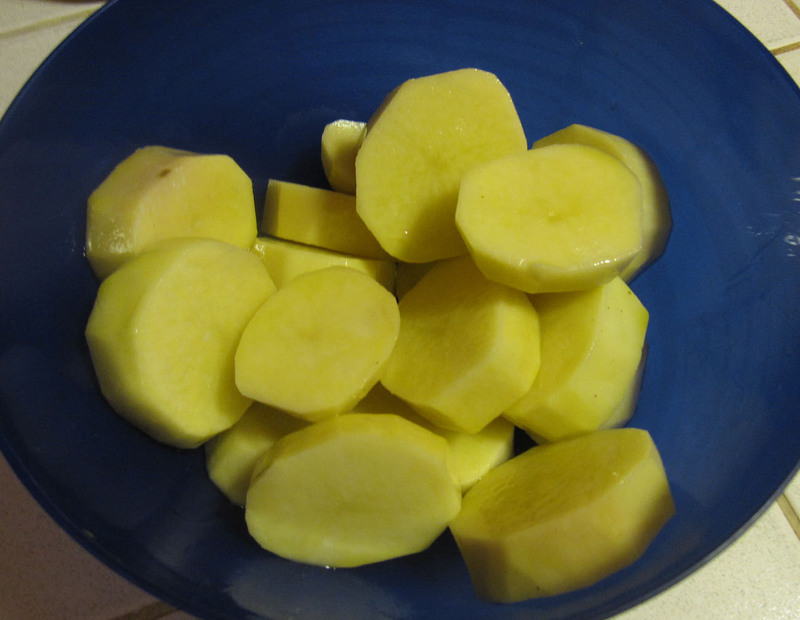 Start with four Russet Potatoes. 2. 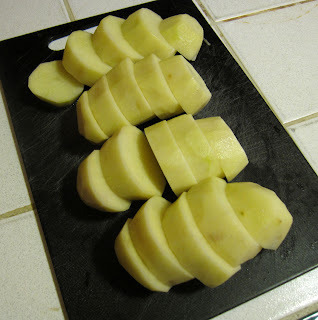 Use a vegetable peeler to take the skins off. Careful - don't take your own skin off. 4. 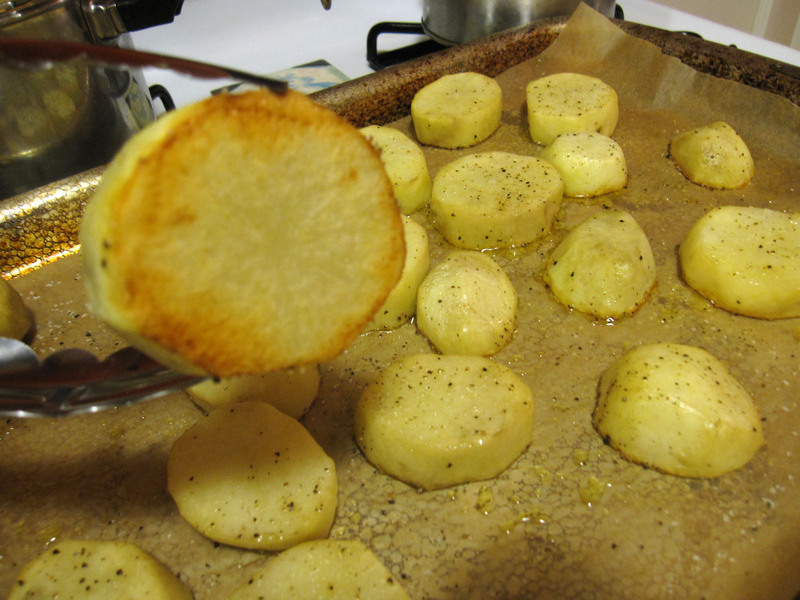 Put the slices into a bowl and pour about 2 tablespoons of olive oil over them and either use your hands or a spoon to coat the potatoes with the olive oil. 5. 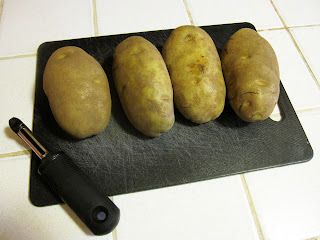 On a flat baking sheet lined with parchment paper (yes, you need parchment paper) place each potato slice onto the sheet. Then sprinkle with salt and pepper. 7. 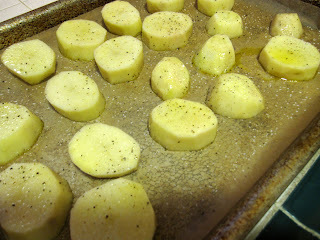 Turn all of the potato slices over and put the sheet back into the oven for about another 25-30 minutes. When done each side should have a nice crispy crust and the inside will be very hot but fluffy and almost creamy in texture. 8. Serve with an entree and a vegetable and you've got a meal full of different textures and flavors which should (hopefully) please everyone. I'm linking up with Debbie for her Tuesday at the Table feature - please visit her to see what she had to say about Root Beer. 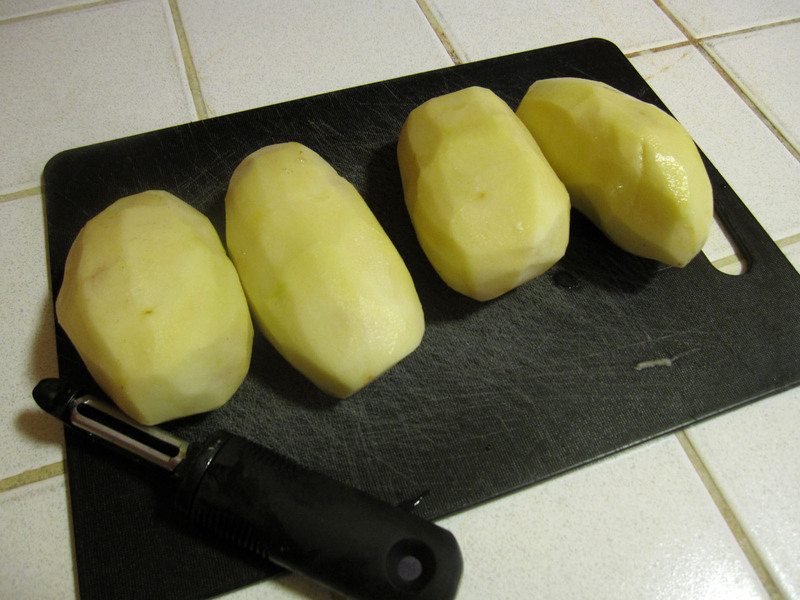 Let me know if you make Roast Potatoes and what you thought of it - and please don't hesitate to ask questions. Yum. 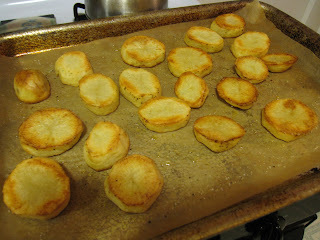 I actually haven't tried this either - I usually just throw random chunks on the cookie sheet! I'll give it a try tho! looking forward to seeing that bag. Yum on the potatoes. And, as a kid we had root beer floats for dessert all the time. When my grands visited last summer, I made them their first root beer floats. Those potatoes look so good, Susan! I have to second what Debbie said she does...random chunks meet cookie sheet...Will definitely try this way though. I've never met a roasted vegetable I didn't like! Good luck on your classes!